Prime Minister Putin has accepted Dmitry Medvedev’s proposal for him to run for the presidency in 2012, made at the convention of the United Russia party in Moscow. 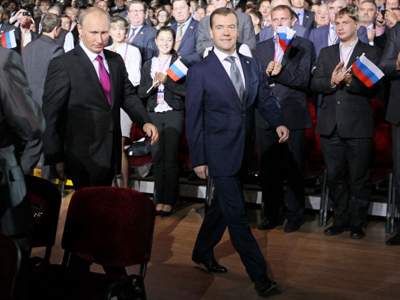 Putin also put forward Medvedev to lead the party’s election list. ­“I consider it to be the right move for the congress to support party’s leader Vladimir Putin as a presidential candidate,” announced the Russian president, talking of the presidential elections, which have been set for March 2012. 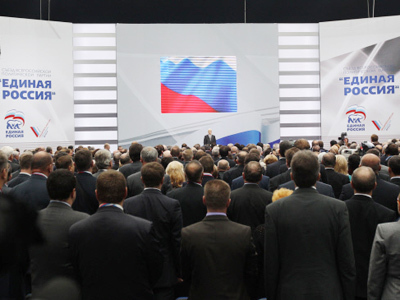 Vladimir Putin, who is the leader of the United Russia Party, addressing the delegates at the gathering, in his turn, has called on the party to put Dmitry Medvedev at the top of the list of candidates at the forthcoming parliamentary elections in December 2011. Putin has also expressed confidence that, with Dmitry Medvedev heading the party electoral list, the party would win the parliamentary elections in December, thus enabling Medvedev to head the future government of the Russian Federation. “I’m sure the United Russia Party will win and, having nationwide support, Dmitry Medvedev will form an effectively-functioning young team of managers and head the government of the Russian Federation to continue then modernization of all aspects of our life,” he said. However, Putin said, neither he nor Medvedev are pre-occupied with the positions they take. “Much more important is what we all do, what results we get and the opinion of the citizens about all this,” he stressed. 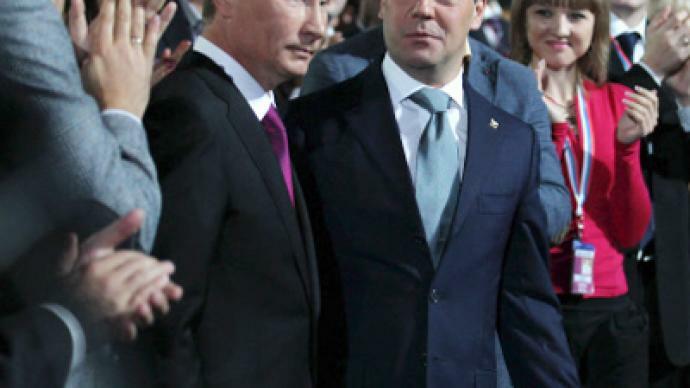 ­The Putin-Medvedev tandem has effectively existed for at least six years. Vladimir Putin was handed his first presidential candidacy in 2000 by then-President Boris Yeltsin. Winning office in those snap elections, Putin was re-elected in 2004. Dmitry Medvedev joined Putin’s team in 2005 in the position of first deputy prime minister, overseeing reforms programs in Russia. In 2008, Medvedev was elected president with informal backing from Putin. “The decision we promote to the congress is a circumspect one and even more than that – we actually discussed this possibility when the tandem had just been formed,” Medvedev confessed, pointing out that the correctness of the chosen strategy has been proven over years. “I was constantly questioned whether I have defined what to propose to the people, sometimes me and Vladimir Putin were both asked if we have ever had a run-in with each other? I would like to fully confirm what has already been said: this is a balanced move and we did give it consideration when we have just formed our friendly union," he added. 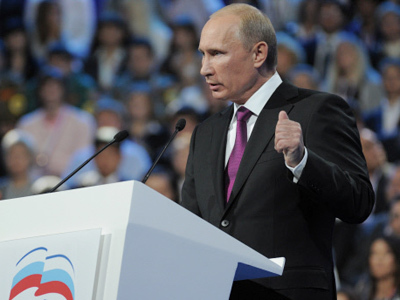 ­In his address to the party, which preceded President Medvedev's announcement, Prime Minister Vladimir Putin pledged that salaries and pensions in the country would continue to grow. He also promised increased funding for education, health care and housing. But Putin has warned of some "bitter medicine" in store for the rich, who, as proposed by the PM, will have to pay higher taxes, specifically, real estate taxes. One of the main aims for the government is to increase the rate of growth of Russia’s economical development, up to 6-7 per cent per year, said Putin. “Rates of our economic growth should dramatically differ from what we have today. We need to return to what we had not so long ago, before the crisis. We need to spin the wheel of economic development up to 6-7 per cent a year,” he declared speaking before the United Russia party congress. Putin noted that Russia’s current economic growth is around 4 per cent, while in the more developed countries it increases by 1-2 per cent per annum. “But this should not disorient us. By absolute volumes that 2 per cent is higher than our four per cent,” warned the PM. At the same time, he expressed confidence that Russia "in the next five years is to be among five leading economies of the world." Prime Minister Putin also said that substantial independence of Russia in terms of food stocks will be reached during the next five years. He has set the task of fully re-arming Russian armed forces in five to 10 years. “During the next five to 10 years we need to completely re-arm Russia’s army and navy forces,” he said. Strategic goals were put on top of the priority list by President Dmitry Medvedev. “Modernization of the economy, political system and social life – this is our marathon. This means we have a common understanding of the future for our country. We have vast common plans for the future, common answers to the most challenging questions our state faces – and this is above all,” said Medvedev. 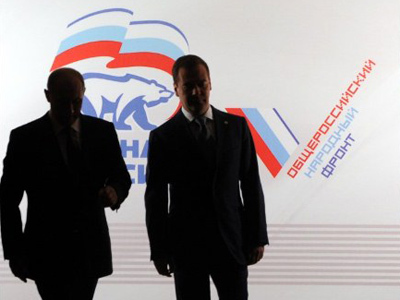 The United Russia Party, which currently holds 312 of the 450 seats in the parliament, unanimously supported the idea to consider the urgings of both President Medvedev and PM Putin as the electoral programme of the party.